I had an opportunity to cruise in the Mediterranean, however, it conflicted with my daughter Tayler’s college graduation ceremony. To my delight, Tayler decided to go on the cruise in lieu of attending her graduation ceremony. 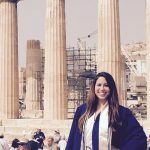 Our mother daughter celebration was in Athens where I photographed her at the Acropolis wearing her graduation gown! We met wonderful people, had a lot of fun, laughs and learned about the local history of the Balkan Peninsula. Our journey began in Athens at the elegant Grande Bretagne Hotel It is centrally located with awesome rooftop garden views of the Acropolis. We wandered through the streets of the Plaka. This is the historical neighborhood, clustered around the northern and eastern slopes of the Acropolis. The Greek food we sampled at one of the many sidewalk restaurants was wonderful. We toured Athens on our first organized tour of the journey (part of our cruise itinerary). It was amazing to see the ancient sites with our guide, Maria. She helped us learn and appreciate the history and the people. The architecture and artistry achieved by these ancient people all those years ago was humbling. It was amazing to see and touch the Parthenon – knowing that it is over 2400 years old! We feasted on fresh seafood and wine at a local Greek restaurant before boarding our ship, the Aegean Odyssey, o perated by Voyages to Antiquity. This ship is small and intimate in size. We enjoyed the educational excursions with expert guides that are included in all the ports. With an average of 350 passengers, we never felt crowded or overwhelmed. It was exactly what we were looking for. From Athens we headed west towards the Adriatic. Our cabin was small but comfortable. We had plenty of room for the two of us and a great balcony where we relaxed with a glass of champagne as we watched the shoreline pass by. The shore excursions included on our cruise were fun and informative. 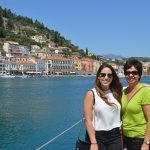 We made three port calls in Greece, spending a day each in the towns of Gythion, Arta and Corfu. Each town had its own distinct feel and culture. In Gythion we boarded a small boat where our guide paddled us through the Diros Cave, ducking our heads to avoid the stalactites hanging from the ceiling. Arta’s beautiful Church of Parigoritissa had outstanding frescos and mosaics. However our favorite find was a small local bakery…yummy. At Corfu, we hiked to the top of their ancient fortress for spectacular views of the cliffs and surrounding area. In Dubrovnik, Croatia we took a walking tour of the old town area where we climbed the stairs to walk along the 10th century medieval wall surrounding the city…another very real reminder of the rich history of this region. We also indulged in a refreshing gelato. We visited the town of Ravenna, Italy, home to eight UNESCO World Heritage sites and is simply beyond words to describe. The mosaics are some of the most beautiful and well preserved of any I’ve ever seen. Our cruise ended in Venice, one of my favorite places. We visited many of the famous sights, ate way too much but had a thoroughly great time. When the cruise ended we flew to Switzerland where we met Barney and Spencer. We toured in Lucerne and took the train to Bern. Then we flew to Rome where we continued on this fabulous vacation in Italy. This was indeed a unique family vacation, as I got to spend a week on a “mother-daughter” trip with Tayler, followed by travels with the whole family . . . wonderful memories to last a lifetime! These are just a few of the highlights of this unforgettable journey. If you are planning to visit this part of the world, give me a call and I’ll be happy to share my experiences with you.